President Obama seems to be struggling about whether or not to make public a series of photographs depicting Americans engaged in torture. The President is taking heat from all sides on this one. His initial position to release the photos was consistent with his insistence on government transparency and public accountability. He changed his mind after conferring with military leaders who worried that the inflammatory photos could compromise the safety of our troops still engaged abroad. This is a tough issue for me because I have a deep sense of the political power of photographs and have seen them used both for and against progressive causes. Perhaps the most powerful torture photograph in our nation’s history is the image of the lynched and brutalized Emmett Till. 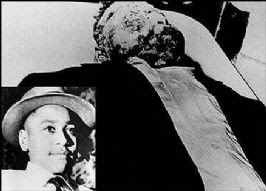 Till was a 14-year-old Chicago boy who went to Mississippi to visit family in the summer of 1955. There he was accused of whistling at a white woman. For that supposed infraction he was dragged from his family’s home, brutally tortured, murdered, and discarded like trash. In many ways Till’s story was more ordinary than exceptional, because black men, women, and children had been victimized and tortured by their fellow Americans for decades. Jim Crow’s vicious, racial code was policed by vigilantes given carte blanche to impose the death penalty when they saw fit. What made Till’s murder unique was the decision to publish the photographs of his mangled body. Till’s mother did something so courageous that it still inspires awe. She held an open casket funeral for her son and allowed Jet magazine to publish photographs of his brutalized body. There was controversy at the time about her decision, but, those photographs of the mutilated boy galvanized a nascent movement for equal rights and launched the contemporary Civil Rights Movement. Till’s example makes me want those torture photographs in print immediately. I believe they may have a deep power to force us to face the horror of what has been done by our country and in our names. But I know something else about the political power of photographs. As a reproductive rights advocate I have been a volunteer who "walked the gauntlet" with women seeking abortions in southern, women’s health clinics. In the early 1990s, when I was in college, "pro-life" supporters would often stand within a few feet of clinics shouting ugly and hateful epithets at patients. Volunteers like me went with these women to hold their hands, and shield their faces as they navigated the protesters. Many of the protesters did more than shout. The also held huge, larger-than-life photographs of terminated pregnancies. The images were ghoulish, frightening, and unrepresentative of the vast majority of abortions, but they are not, strictly speaking, inaccurate. Certainly anti-choice advocates believed that their photographs of horror could and should immediately stop a practice that they defined as evil and torturous. While I can see their side, I found the protests unduly upsetting for women already facing painful, difficult, and deeply personal decisions. The photographs may have been true, but I believed that revealing them did far more harm than good. Thus I find myself in an unsatisfying gray area with respect to the current torture photos. I generally support President Obama’s decision not to aggressively pursue prosecution of the government officials or lawyers implicated by the torture memos. I derive that position from a belief that truth and reconciliation is the best model for the U.S. to follow on this issue. I believe that revealing information and understanding what happened is the most important task we should engage in with relation to torture. I don’t want Cheney in jail, but I want him to have to tell the truth -live- on TV- repeatedly. Consistent with that commitment, I believe we should release the photos and simply cope with the political, moral, and national pain that may follow. On the other hand our sons and daughters are still overseas. We have not fulfilled the promise to bring them home. Until we do so we have to protect them as best we can from our places of relative privilege here in the United States. I strongly believe that no good is served if even one of our soldiers is abused in retribution for our failings or as a result of our moral self-righteousness. Photographs of horror are powerful. That power should make us sober and careful in deciding how to use the images.